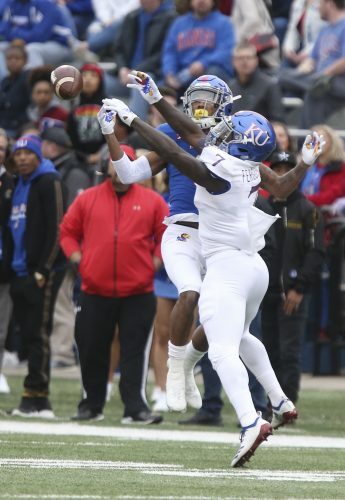 Kansas running back Pooka Williams Jr. jumps over a teammate to gain more yards against Oklahoma State on Saturday, Sept. 29, 2018. 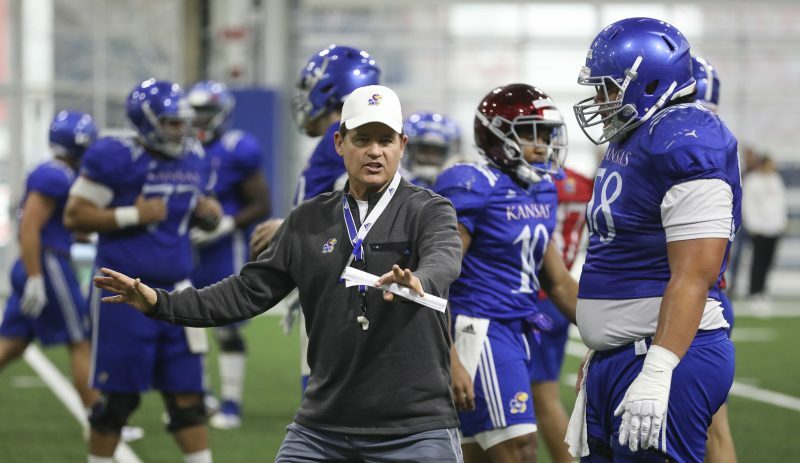 What exactly the Kansas football team’s lineups and coaching staff will look like by the time the 2019 season gets here is anyone’s guess at this point. 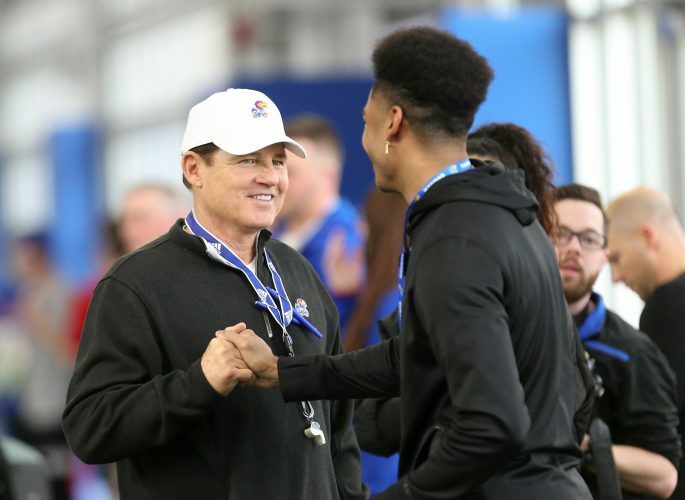 As of Thursday, though, with the Big 12 unveiling next season’s football schedule, we now all know the dates on which the Jayhawks will be playing on the forthcoming calendar. 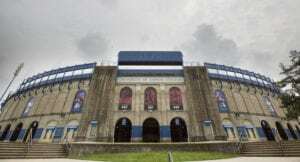 KU will stick around Lawrence more often than not, playing five conference games at David Booth Kansas Memorial Stadium in 2019, and four on the road, following a nonconference schedule that features two home games and one road trip. The season also will include two bye weeks. The Saturday of Labor Day weekend, as previously announced, Kansas opens in Lawrence against Indiana State, on Aug. 31. 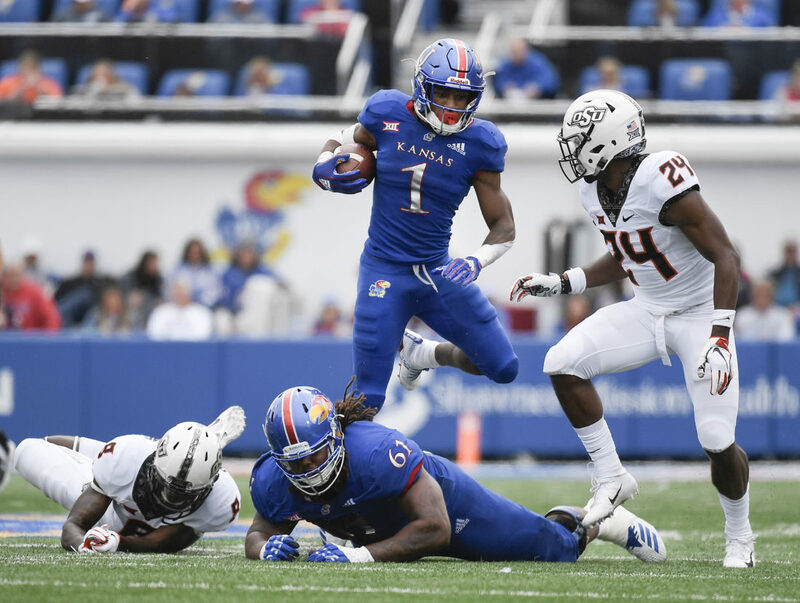 The Jayhawks get another home game a week later, against Coastal Carolina, on Sept. 7, before they head out to the northeastern most portion of ACC country for a game at Boston College (Sept. 14). 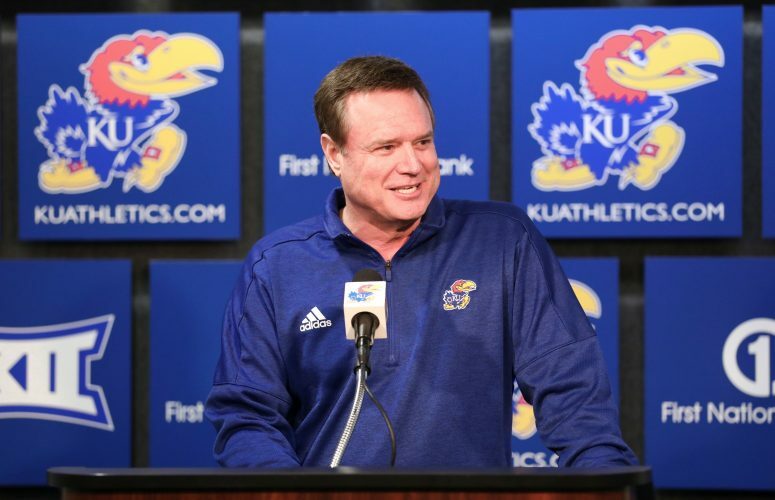 From there, KU jumps into Big 12 action by playing host to West Virginia on Sept. 21. Next comes a trip to TCU (Sept. 28) and another home date, against Oklahoma (Oct. 5), before a midseason bye week. The six-game stretch to close the 2019 schedule begins at Texas (Oct. 19). Then three of the final five games come at home: Texas Tech (Oct. 26), Kansas State (Nov. 2) and the season finale against Baylor (Nov. 30). KU’s back-to-back road games leading up to the finale come at Oklahoma State (Nov. 16) and Iowa State (Nov. 23), immediately following a rare second idle week (Nov. 9). Dates are subject to change as adjustments are expected to accommodate television partners’ requests. Decisions regarding television and game times for the first three weeks of the season and special dates will be announced in June. The 2019 Big 12 slate features a 10-team, nine-game, round-robin schedule for the ninth season in a row. It marks the third consecutive year each team will play nine conference games with a championship game implemented. The top two finishers in the regular season standings will compete for the conference title in the Big 12 Football Championship Game, which is scheduled in 2019 for Saturday, Dec. 7. The championship game will be played in Arlington, Texas’ AT&T Stadium through 2021.